News of the Restless: Festive Left Friday Blogging: Everyone hates Hugo! 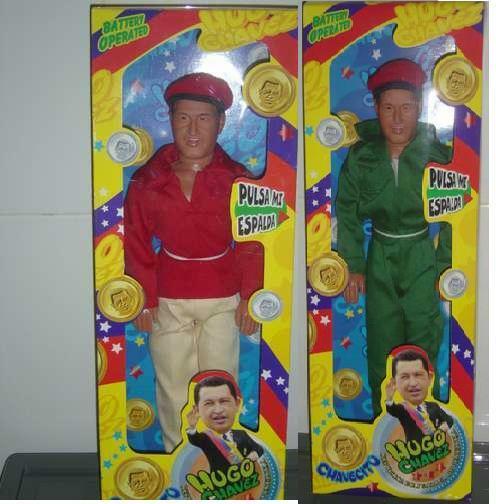 In honor of Hugo Chavez's recent flurry of shuttle diplomacy and friendly visits, and the corresponding media circus and propaganda offensive against it, I feel inspired...to bring you satire. 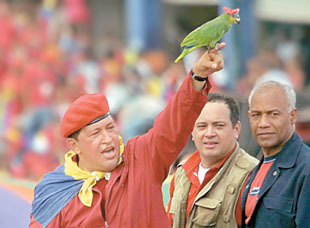 Since everyone from the stodgy old London Times to the wingiest of the wingnuts wants us to believe that Hugo Chavez is both a hopelessly inept buffoon and a force of Evil to be feared, I must oblige. So, Gentle Readers, welcome to this Friday's festive blog entry: Everyone Hates Hugo! Hugo claims he's ugly. Yeah, I can see why. I mean look at him, wearing camouflage. He must be trying to blend into the landscape so no one sees how hideous he is. That grin scares the hell out of me. And who's he pointing the finger at? Could he be giving someone the Evil Eye? Well, whoever it is he's pointing the Finger of Doom at, don't despair. These custom-made voodoo dollies will help you reverse the curse, whether he's in camo or civvies! 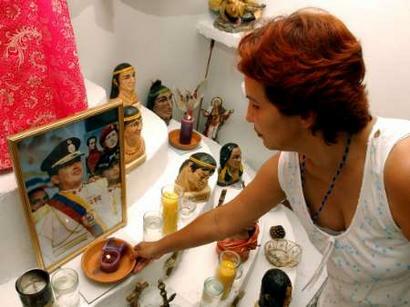 And if you don't think the dolly alone will do the trick, why not build an altar and cast your curses in style? Run, Michelle! RUN!!! Don't let the horrible fate of Cindy Sheehan befall you! Need I remind you that he chewed her ear off? 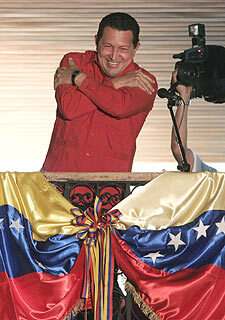 Yes, folks, it really is true: Hugo Chavez is a vampire. He's sucking your blood by selling you oil. And now the whole world knows it. Good photos. I am especially encouraged by Bachelet. Thankfully, she will not be a yankee stoodge in the region. 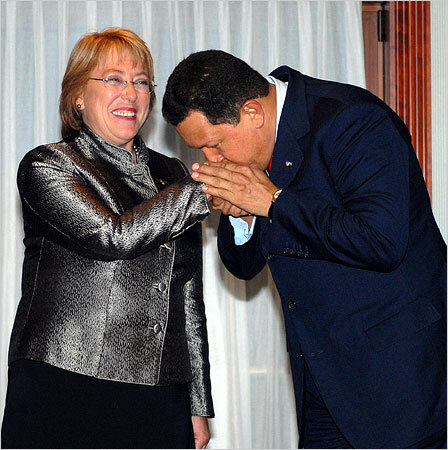 Yeah, Bachelet is one of the most underreported Chavez-supporters in the region (Lula of Brazil being the other; I'm gonna post more on him later, as I dig up the URLs proving it.) 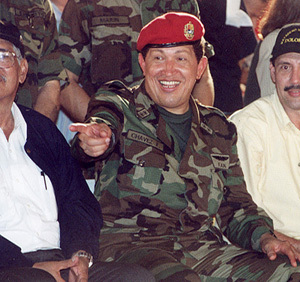 BushCo seems to have an interest in claiming that these leftists are "too moderate" to approve of what Chavez is doing, but I don't get that impression at all...at least, not from reading the LOCAL media.